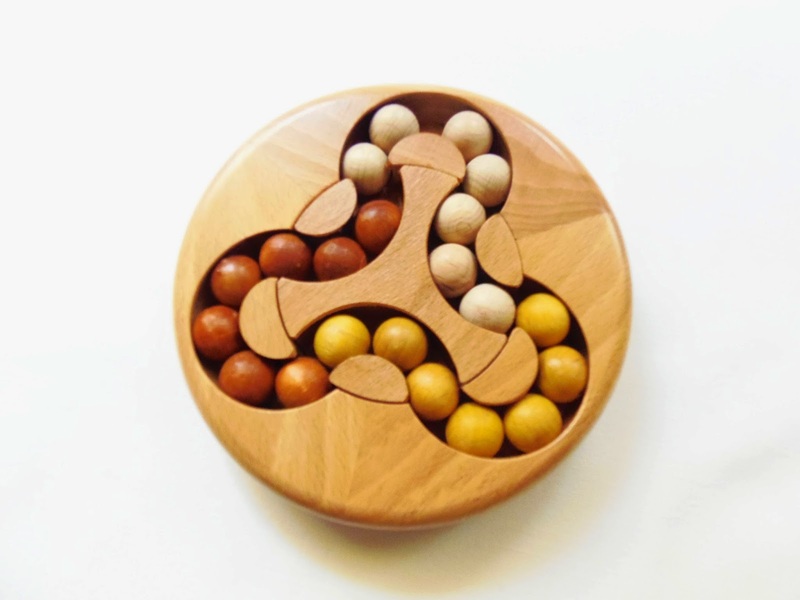 Our Common Goal is yet another interesting puzzle from the German manufacturer Philos, designed by Logan Kleinwaks. I'm a sucker for pattern puzzles and this one captured my attention right away because of its high contrast of light and dark shades made by hevea and samena woods. The puzzle features 16 identically shaped pieces, although there are seven different patterns of light/dark parts glued together. The goal of the puzzle was somewhat confusing to me at first. 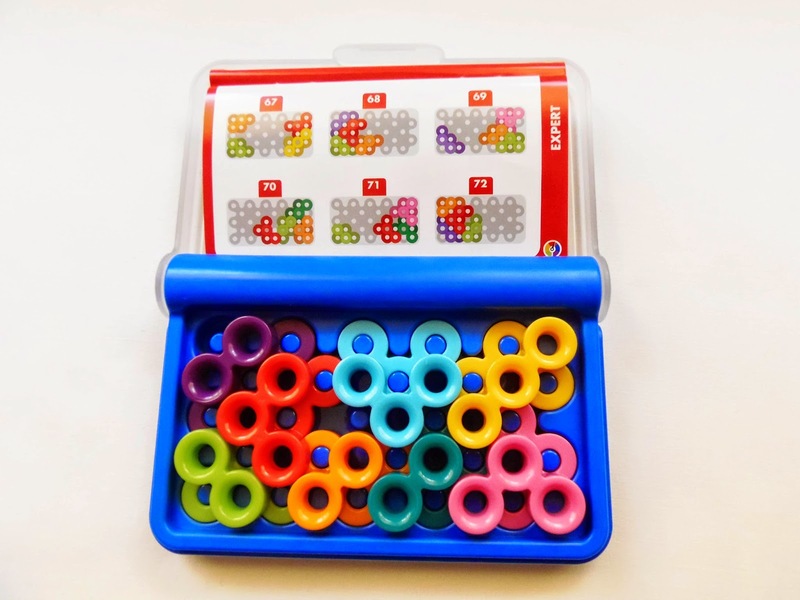 I thought the pieces had various ways to be put together in various patterns (7 to be exact), but it turns out that there's only one pattern you're supposed to do, which is the one that is already shown in the picture on the package, and it actually comes packaged in its solved state - shame really, because the explanation makes you think that there is 7 different patterns to build, but they're referring to the patterns on the pieces. So, the goal is to remove the pieces from the tray, mix them, and then try to make the requested pattern. 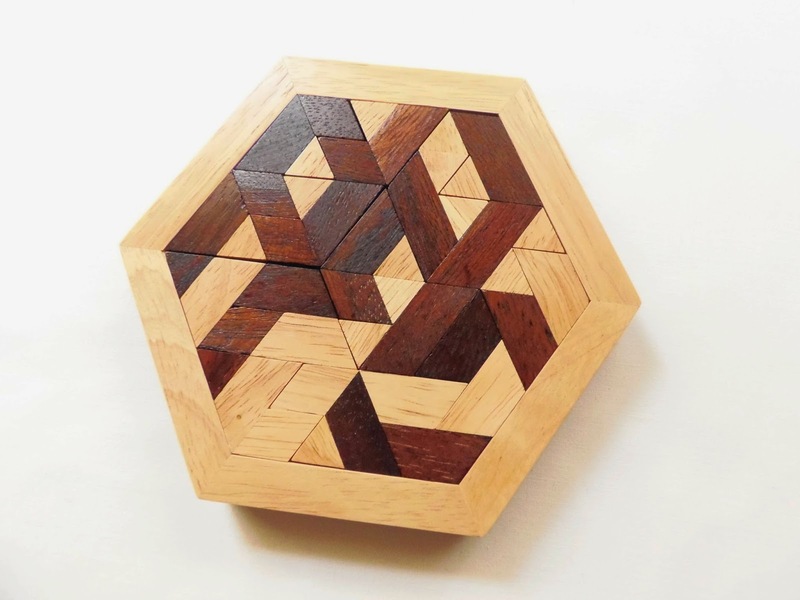 Don't be fooled by the fact that the puzzle comes in its solved state, because it will be quite challenging to return it to the original pattern. It is rated as a level 8/10, and I reckon it's pretty accurate, given the unusual shape of the pieces and how they must be packed in the tray. On top of that, you have to keep in mind which pieces to use at a certain time to make the original pattern. 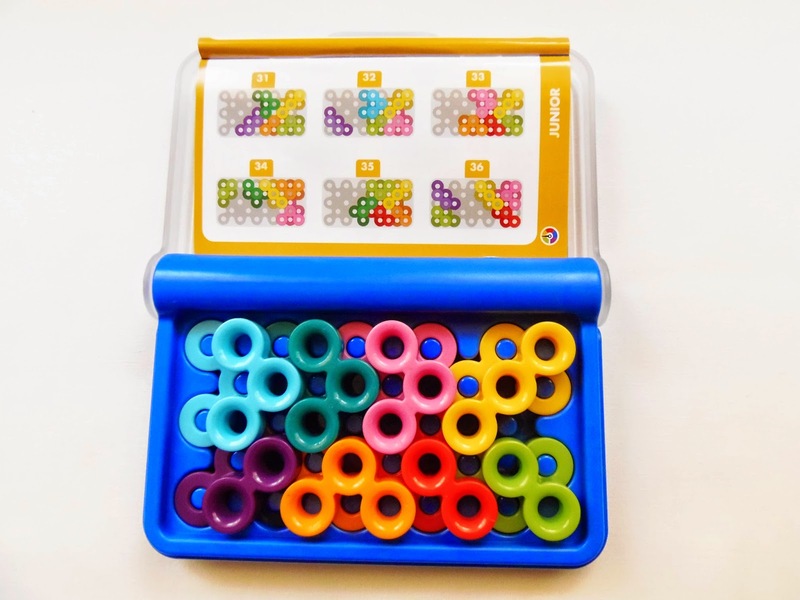 The puzzle is more or less a 2-in-1 puzzle, as it's first and foremost a packing puzzle. Even though the pieces are identically shaped it's still challenging to pack them all in the tray. Try to do that by just packing the pieces and not minding the pattern. You'll see that it's not that easy. Now, try to pack them, this time carefully selecting the right pieces for each spot. After solving the main - and only - challenge, I tried to make other patterns that made sense geometrically, but all I could come up with were random configurations. I still believe that with lots of patience and a careful analysis of the pieces it's possible to make other symmetrical - or at least less chaotic - patterns. If you put your mind to that, you might have a serious challenge in your hands. Are you up for that task? Our Common Goal by Philos was a bit less than I was expecting, but still was quite a challenge. 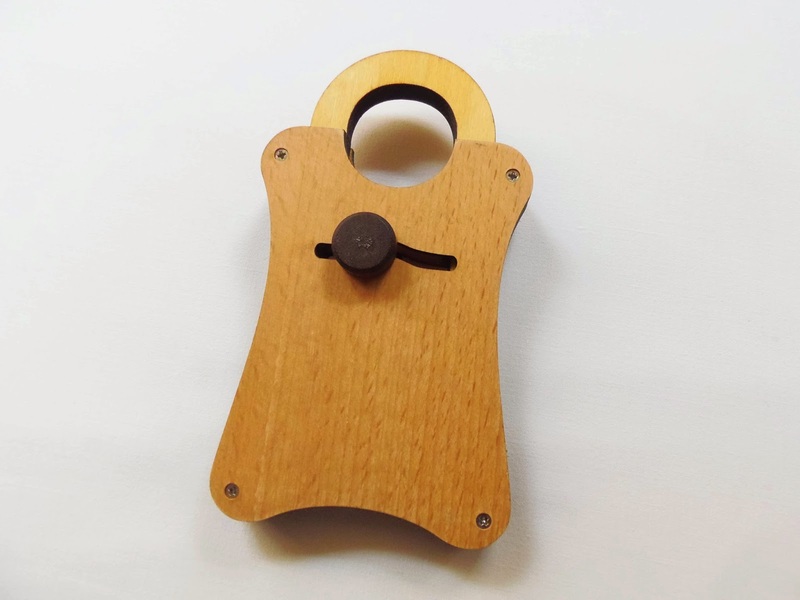 It is really well made, something already to be expected from the German manufacturer, and it could be used as a nice center piece to decorate a coffee table or a shelf. Availability: You can get a copy of Our Common Goal at PuzzleMaster for $28.99 CAD. Check out other designs by Philos if you like their puzzles. 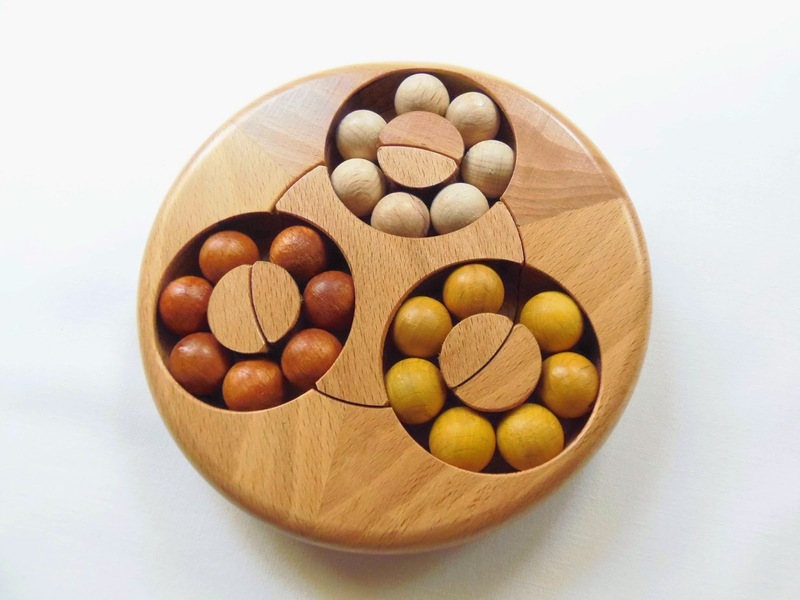 The Flower puzzle is comprised by a hardwood frame, nicely polished, and three sets of seven beads, each kept in place inside three ring slots. 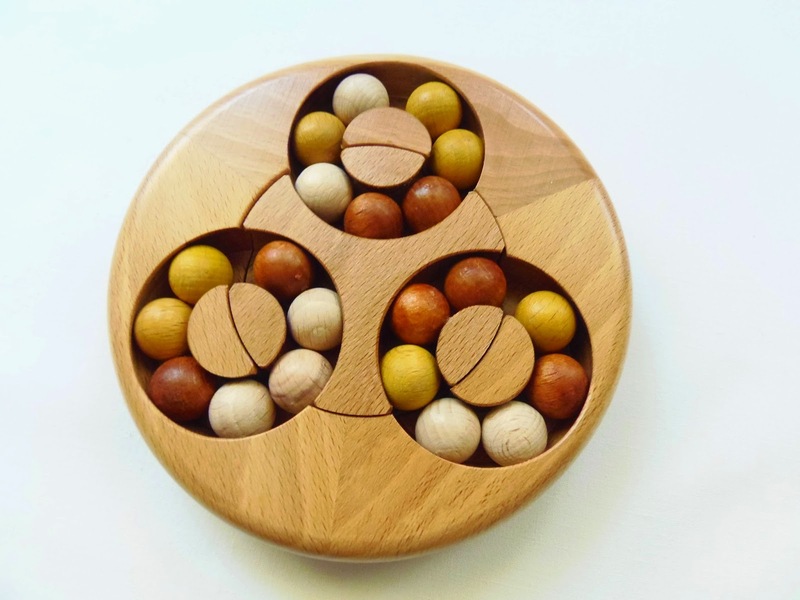 What surprised me in the design of this puzzle was that the beads were also made of wood - usually they're made of plastic. And they're actually natural wood colors, not painted as you'd first think. 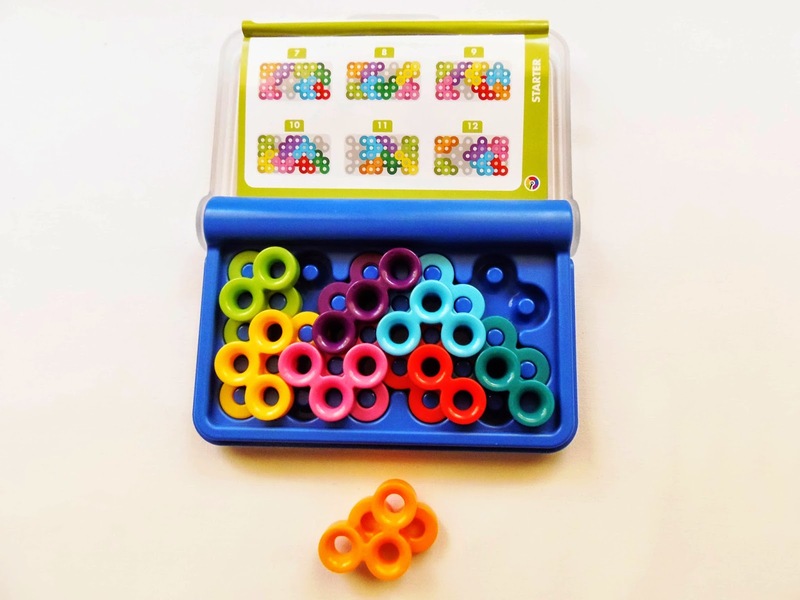 The puzzle moves by way of a rotating wheel at the center which makes the beads swap places with one another, thus mixing it. Inside each ring you can also rotate the beads freely. The center wheel only moves three beads from each ring at a time, so you must choose carefully which beads you want to move before turning the wheel. 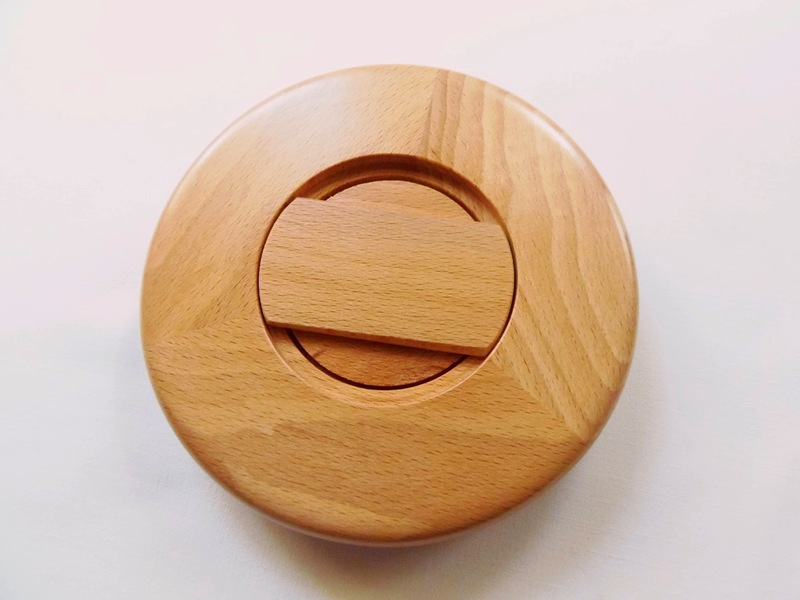 There's a small wooden handle at the bottom of the frame to make turning the wheel much easier. The movement is smooth, it doesn't jam or anything, unless you have the beads misaligned. The difficulty is surprisingly easier than I was expecting. Rated as a difficulty level of 9/10, I thought this was going to be one hell of a challenge, but I solved it in about 5 minutes or so. And yes, I had it pretty well mixed, so it couldn't have been an easy to solve pattern. I honestly believe the puzzle is no harder than a level 7. 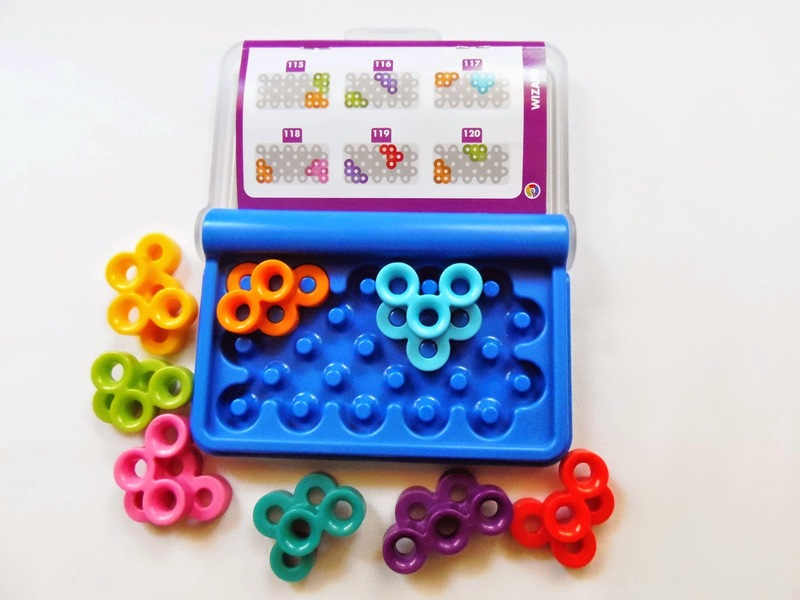 I also have solved another one of their bead puzzles (seen below) and the difficulty was about the same. Overall, the Flower is a very fun puzzle to play with, despite being not so challenging. It's an original concept, simple but fun and entertaining. The company has a few other designs featuring beads, all very interesting and deserving of your attention. Availability: You can get the Flower puzzle at your favorite Canadian puzzle store, PuzzleMaster. Check out other designs by the Czech company. 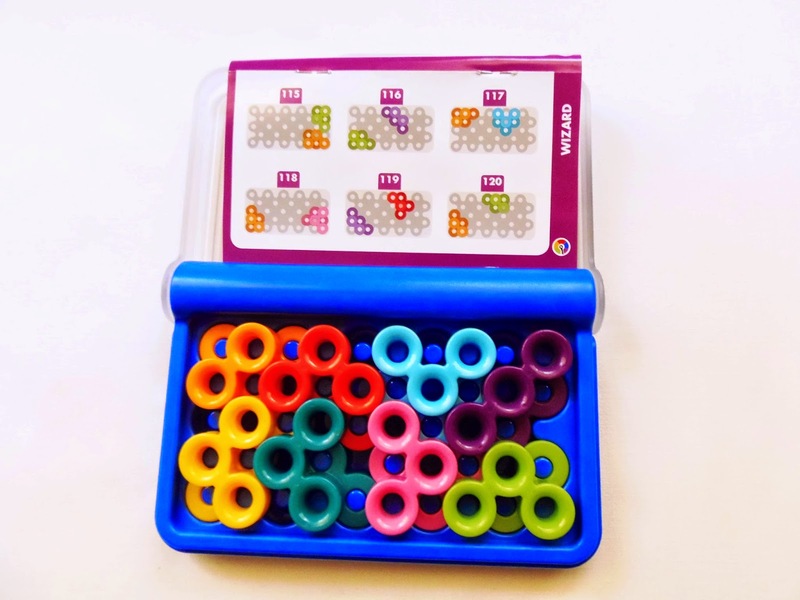 I'm always excited when I have a new puzzle game from SmartGames. It's because I know for sure I'll have lots of fun with a new concept I haven't tried before - something really difficult to achieve for a games designer when you already have a vast catalog of different ideas. The IQ Steps is, so far, the only one that requires the pieces to be placed in a correct sequence, not randomly fitted in the game board. This, in addition to the unusual shape of the pieces, makes the game very difficult to solve, even on the easier challenges. In fact, even when you're setting up a challenge it's difficult to figure out the correct sequence for the pieces, and that is in itself a challenge, before the real one even begins. At first, you only need to place one or two remaining pieces to the set up, but getting there requires some patience. 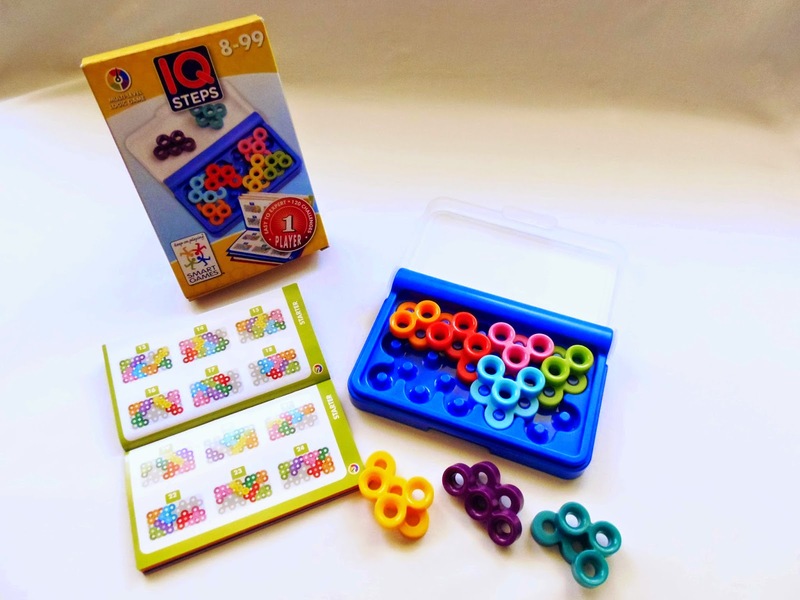 On the harder levels, you not only need to place most of the pieces and figure out where to place them, but also finding their correct sequence. 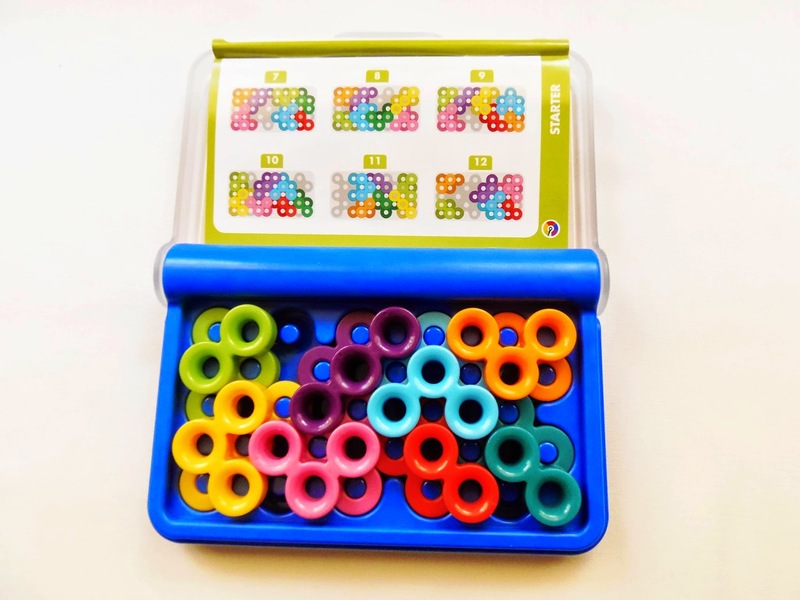 Comprised by eight distinct pieces in bright vivid colors, each one occupying two layers with five or six rings joined together in different arrangements, the pieces overlap each other in the game board, which is why they need to be placed sequentially. 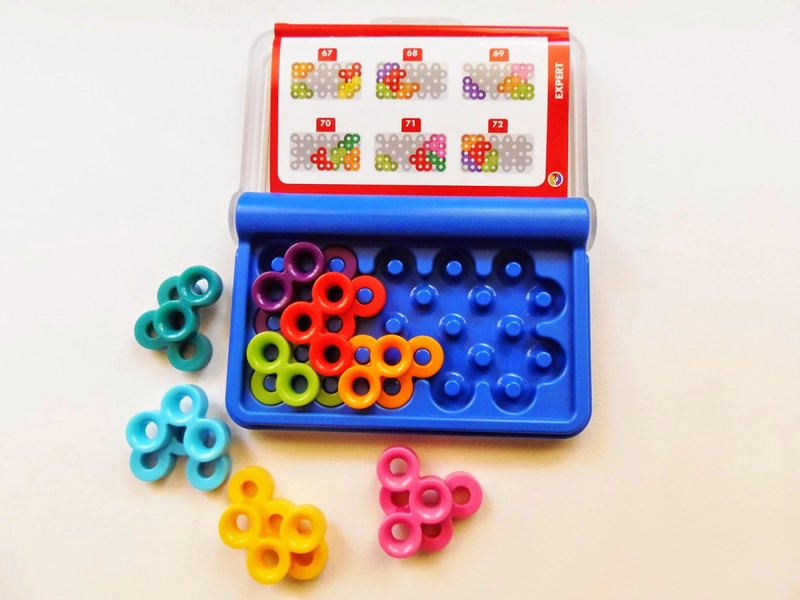 It's a very entertaining game, like discovering the sequence of a secret code. With 120 challenges to solve, distributed by five difficulty levels, you have more puzzles to play with than the average logic game - a very welcome addition. To play any challenge the right way you have to respect some basic rules: Since the pieces have to be placed in a sequence, you need to place them one at a time; You can't lift any piece that has already been placed on the game board; Two layers is the maximum height permitted and any piece that stacks on top of another in more than two layers is not allowed. Like many other games, IQ Steps has only one possible solution for any given challenge. IQ Steps is one of my favorites from the IQ series. I guess I say that a lot when it comes to SmartGames, but it's true. Every new game I try adds a different idea and a new way to interact with puzzle pieces. Their games challenge you in ways you weren't expecting, and for that I can't wait to play with the next puzzle from SmartGames. 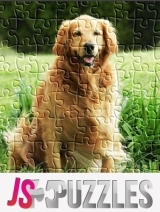 Availability: SmartGames' puzzles and games are widely available on any decent puzzle stores. Amazon and PuzzleMaster are just two great examples where you can get what you're looking for. Transylvania - A land of mystery and fascination, mostly known through the 1897 Bram Stoker's novel, Dracula. It's only fitting that what I'm about to introduce you is also something that fascinated people all over the world for centuries, which is puzzle boxes. These enigmatic and puzzling objects were first introduced as a way to keep one's most prized and precious possessions a secret. 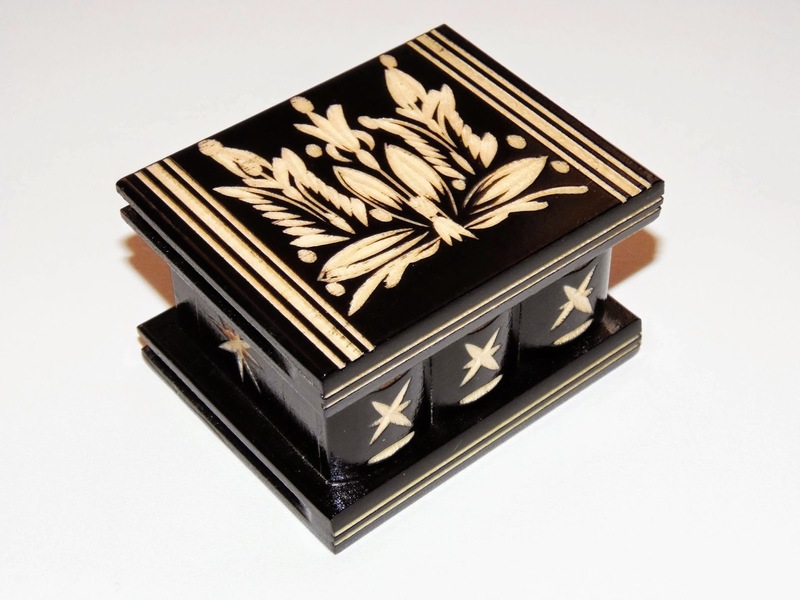 That's exactly what the craftsmen of these Romanian puzzle boxes had in mind when they first created them in the 1700's. It was also a nice way for men to court their future wives, since they could show off their skills and ability. The tradition was kept from generation to generation by way of passing the know-how from father to son. 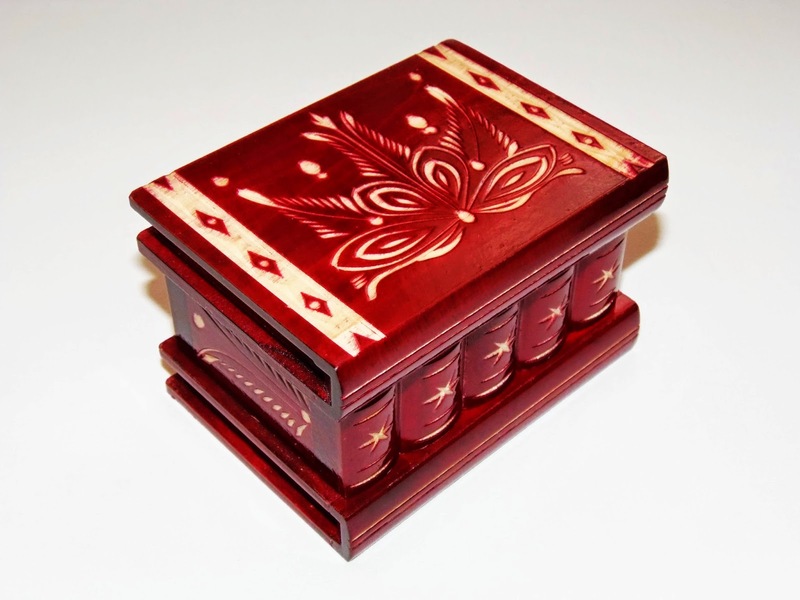 The modern take on these traditional puzzle boxes was done by Istvan Bondi, from the region of Kalotaszeg, Romania, who made and carved them for a while, now concentrating mainly on distributing them. A small team of makers and carvers make the boxes now, always following the same traditional hand-made methods. You can visit the official TransylvanyArt website for more information. The company also makes beautiful and detailed Chess/Backgammon/Checkers wooden sets. From the colors you see on the boxes, to the different sizes and floral patterns carved on the boxes, everything was meticulously planned and designed with the utmost attention to detail, all hand-crafted and made from local maple and beech wood. An experienced craftsman can make between 5 to 7 puzzle boxes a day, and carving one box takes about 30 minutes - Steady hands, lots of concentration and perseverance are some of the skills necessary to make these boxes. 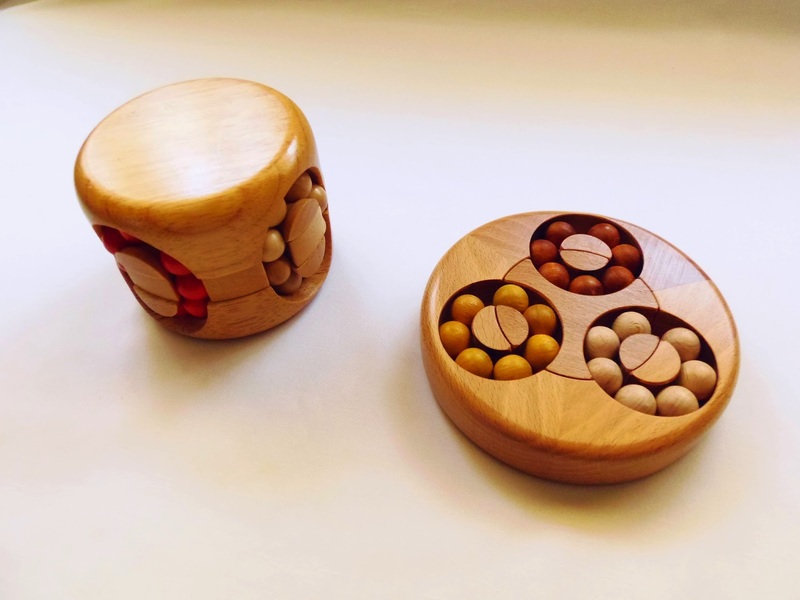 There are three different sizes for the puzzle boxes: small, medium and large. 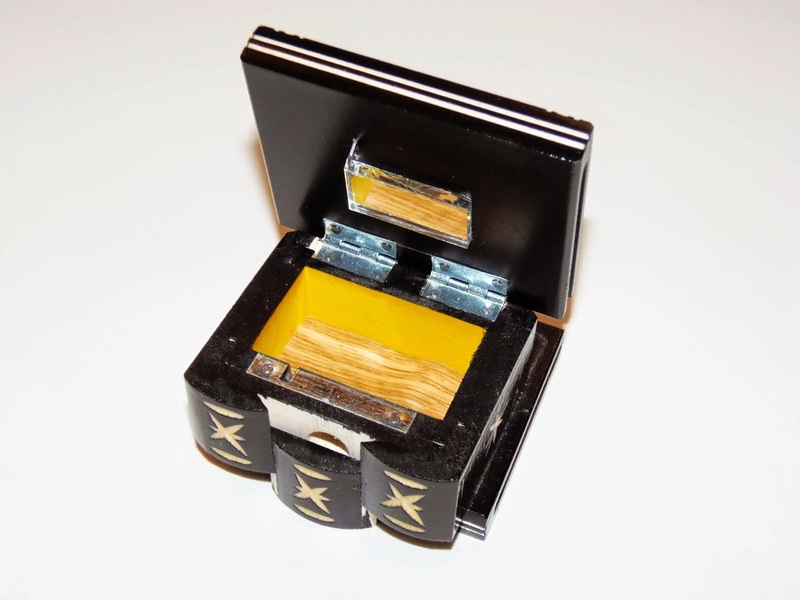 The small box measures 8cm x 6.4cm x 4.8cm (3.2" x 2.5" x 1.9"); the medium measures 10.7cm x 8cm x 7cm (4.2" x 3.2" x 2.8"); and the large one measures 14cm x 10cm x 8cm (5.5" x 3.9" x 3.2"). 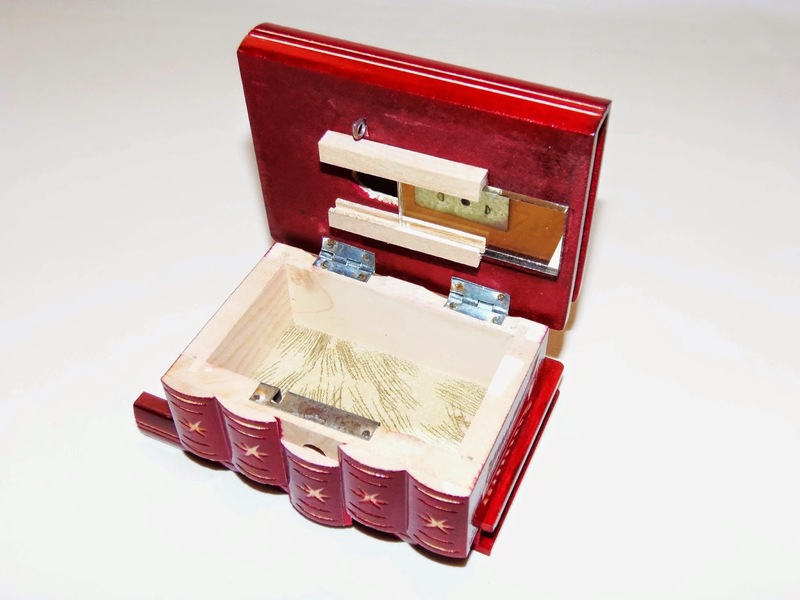 There are some modifications on the opening mechanism that differ from the small to both the medium and large boxes, but the same original and innovative way of opening them is common to all three sizes. 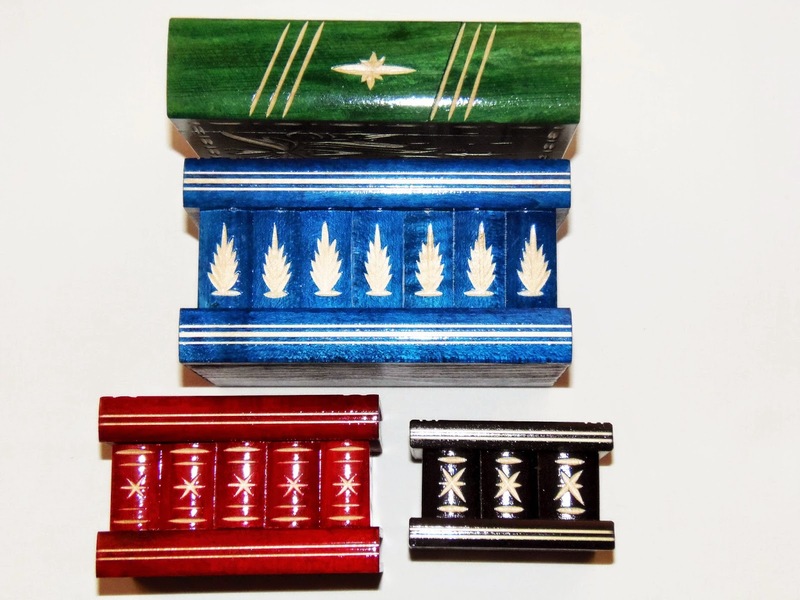 The colors are more varied and there are five different ones to choose from: black, brown, blue, red and green, all available to any of the three box sizes. 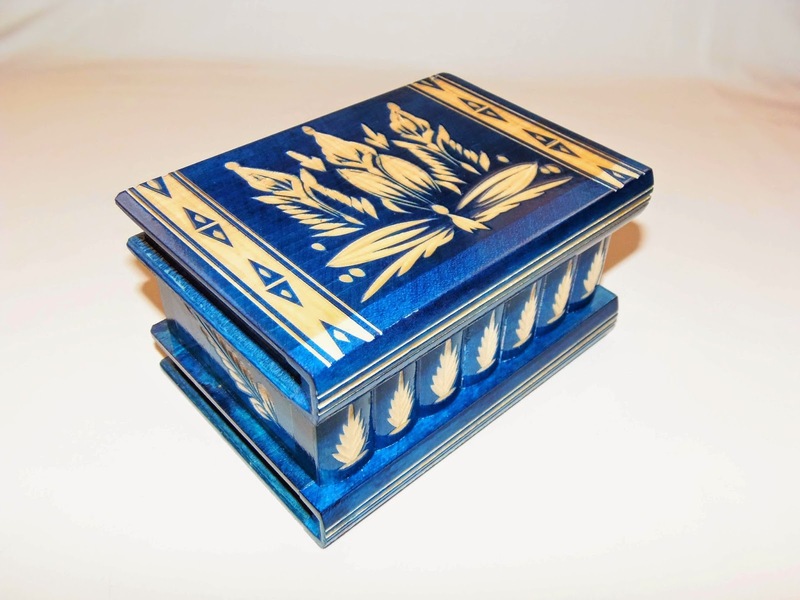 The floral patterns carved on the boxes were what I found most fascinating about these boxes. 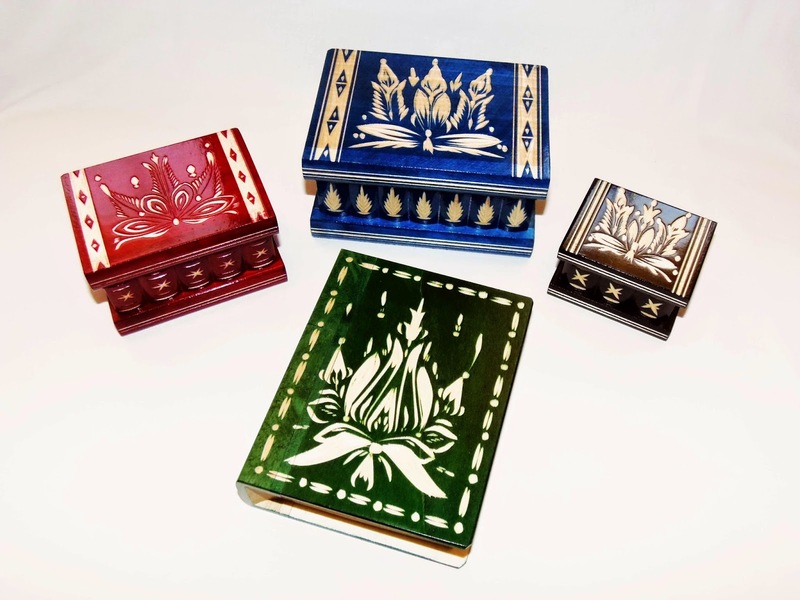 The decoration, or presentation, says a lot about a craftsman's work, and here on these boxes you can witness the high level of craftsmanship, only achieved through centuries of passed-down knowledge. The overall appearance of the boxes, although merely a coincidence, resembles a stack of books on a shelf. This is most noticeable on the red box, as the side of it sort of looks like the spines of several books. Even though it wasn't the intention of the designers, I find it adds character and personality to the boxes, more style. For a more exquisite and elegant finish, the surface of the boxes is varnished with clear and shiny lacquer, which also serves to protect the wood from the elements. Talk about books... As you've seen from the top photo, there's a puzzle that looks exactly like a book, and that one is no coincidence. 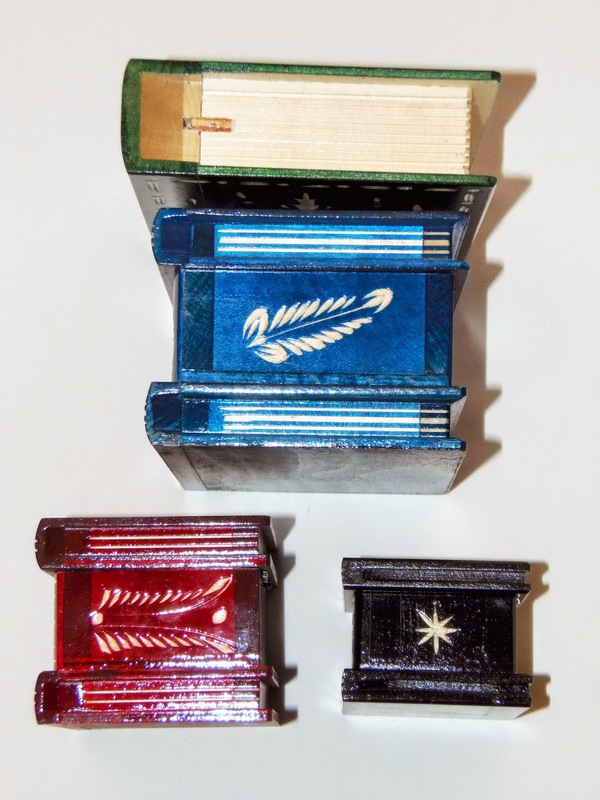 Designed by another talented Romanian craftsman, these puzzle books have a totally different mechanism from the boxes, and are a little easier to open, since they only require a couple of moves. 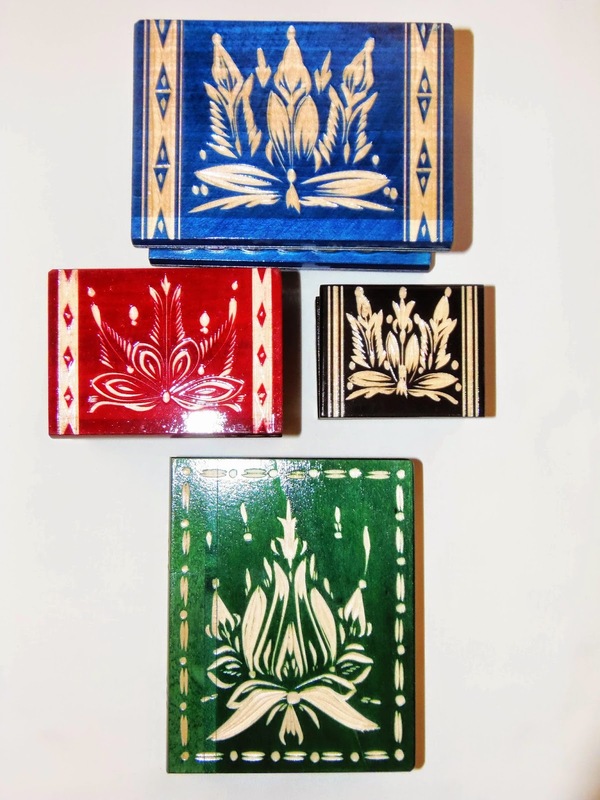 They share, however, the same beautiful type of floral patterns and colors of the puzzle boxes as two siblings would do. 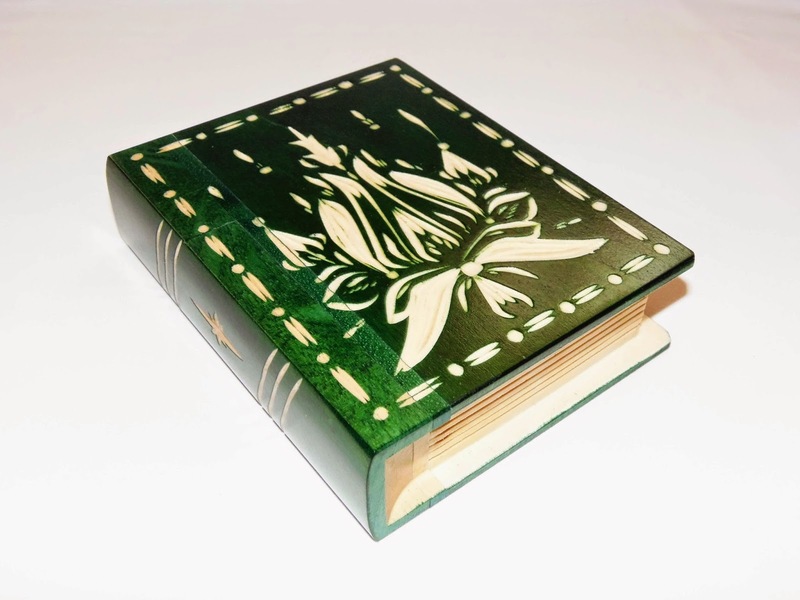 The puzzle book is about the same size as a normal book, measuring 15cm x 11.7cm x 3.8cm (5.9" x 4.6" x 1.5"). 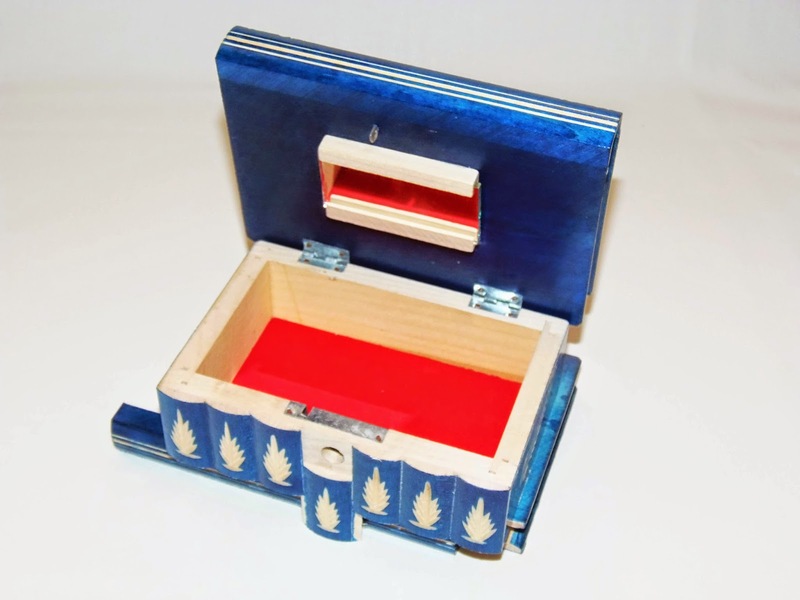 The hidden compartment is large enough to conceal many objects, like a gift to someone special. Returning to the theme of the boxes... To open them, a little more cunning and astuteness is necessary than to open the book. The opening mechanism sort of reminds me of those secret rooms hidden behind a book shelf - How you'd reach for a particular book and turn or slide it in a way so it unlocked the door. The whole process until you finally open the box is some of the most creative and original works I've seen in puzzle boxes. You need a couple of steps for one part of the opening process, and another couple of steps to actually open the lid. This is where the difference between the small and the other two boxes lie, which is a couple of steps. It's different enough to justify the purchase of a small box along with at least one medium or large box. Also, another interesting difference between the two bigger boxes and the small one is the hidden compartment inside the lid, once opened - There's none in the small box. This hidden compartment is found behind the mirror of the larger boxes by way of sliding it sideways. It's just another clever addition to these already fascinating objects. I really loved TransylvanyArt's puzzle boxes and book. They're quite unique, completely different from anything I've seen, with a brilliantly clever mechanism and a gorgeous and striking design. If you like puzzle boxes, this is definitely a must-have in your collection. It's a beautiful decoration center piece, a perfect gift for a loved one, or simply to indulge yourself with a magnificent work of art. It's a masterpiece! 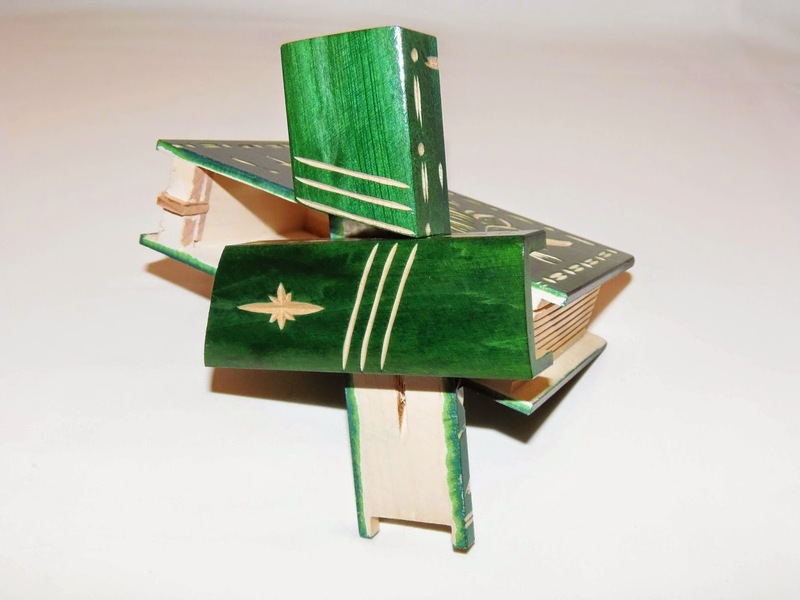 Availability: There's a couple of places where you can get these beautiful puzzle boxes and the puzzle books. PuzzleMaster from Canada, and PuzzleBoxWorld from the USA. 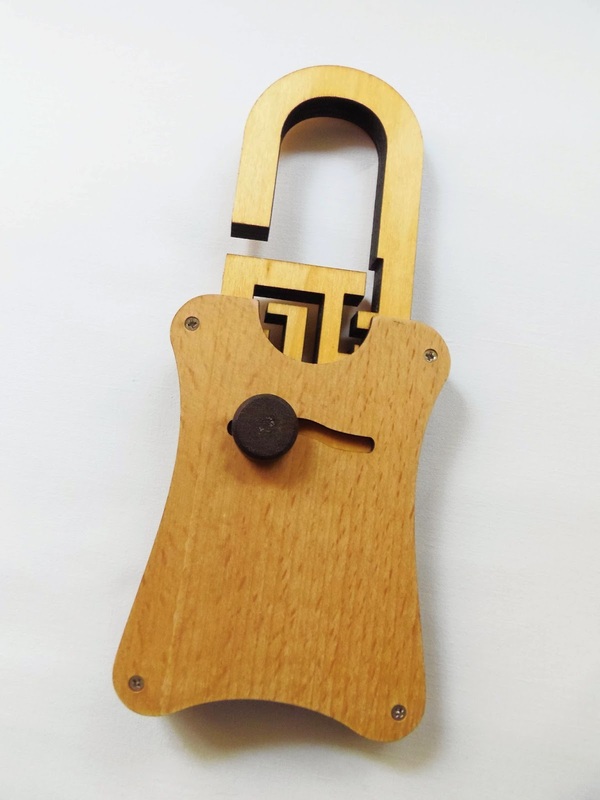 There's a series of very interesting Trick Lock puzzles by Mi-Toys that use a very clever mechanism, called IQ Locker. 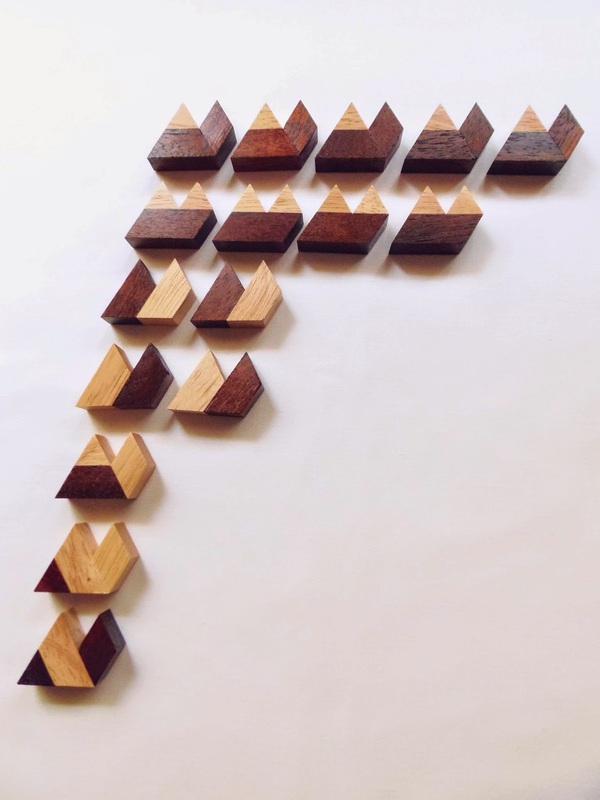 These puzzles are pretty cheap (about $11) and made of wood - not proper wood (laser-cut), but you can't ask much for that price. 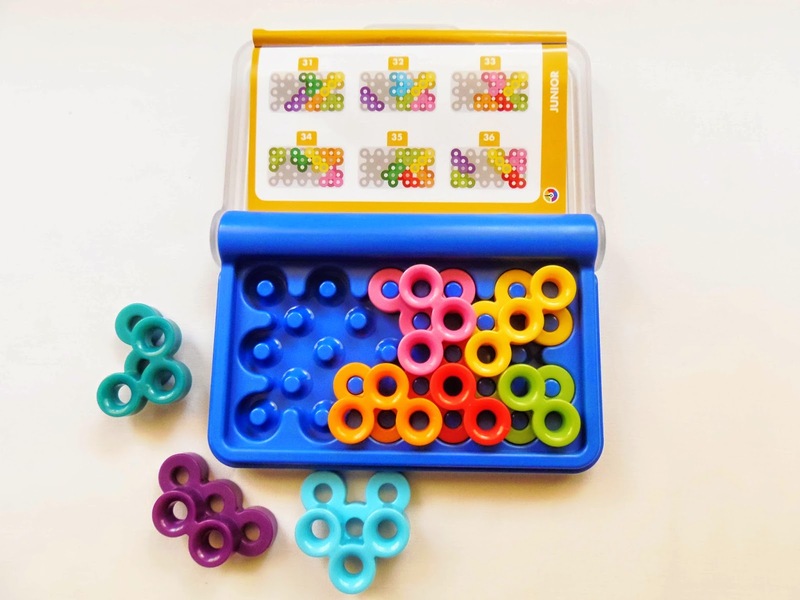 Each puzzle has a very original design, and despite the low quality materials, their mechanism works quite well. This time I chose the Lock Maze and, as the name suggests, you'll be navigating a small maze in order to be able to unlock it. To help you navigate the maze there's a small sliding button that moves horizontally through an opening in the puzzle. Both sides of the lock are identical, including the sliding button, so you can easily change perspective, although you can't see much of the maze through the opening. 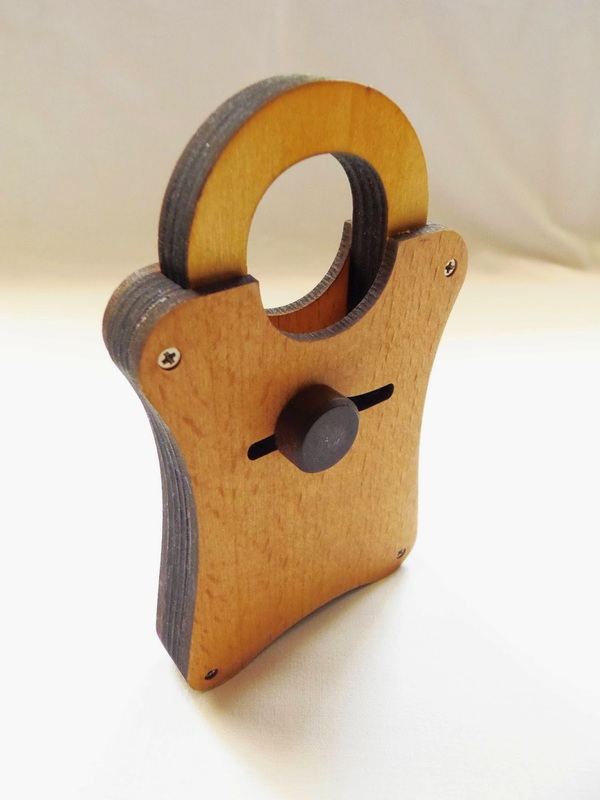 The mechanism doesn't allow for the shackle to be completely removed from the wooden frame, but it can slide off enough so that you can see most of the maze path. In other words, don't stop right away when you first see the shackle opened, since there's more to it. Unfortunately, the puzzle is not very challenging, and considering it's a maze, it's a little disappointing to be so quickly solvable. The manufacturer rates it as a level 2/5, but it might as well be a level 1, as I was able to open it in only a couple of minutes. Closing it is equally and unsatisfyingly easy, because there's virtually no challenge. The puzzle measures 14.6cm x 7.6cm (5.75" x 3"), and the problem of being so easy could've been simply solved by a larger maze - In my opinion it would've resulted in a much better puzzle overall. If you're a fan of Trick Locks and like to collect them all, there's no reason not to get the Lock Maze. Also, if you're a beginner in this type of puzzles, it can be good to practice for higher demanding levels. But for seasoned puzzlers, unless you're a collector like me, it can be frustratingly easy. 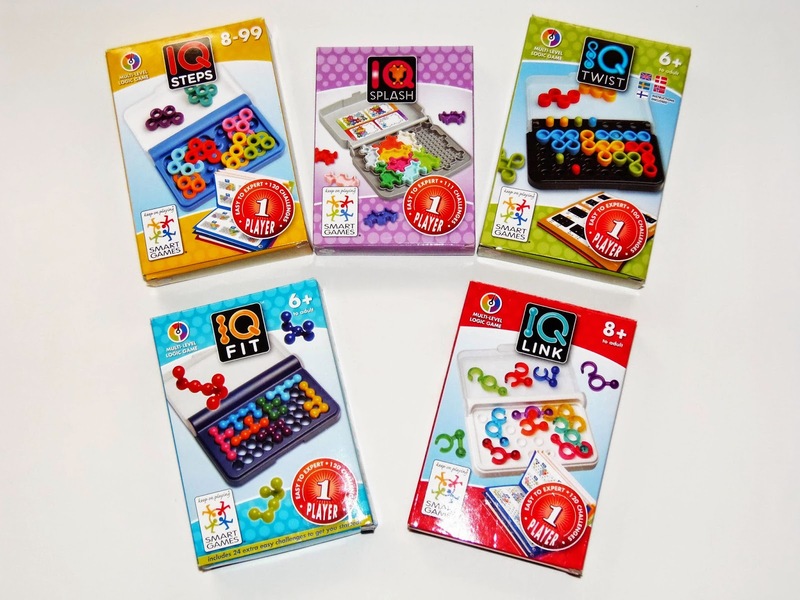 Availability: You can find the Lock Maze and all the IQ Locker series at Brilliant Puzzles for just $10.95 USD each.